Tillich in dialogue with past and present thinkers and how theology can benefit The broad impact of Paul Tillich on present-day philosophical-theological thoughtforms--especially of Protestant Christianity--continues unabated into the new century. 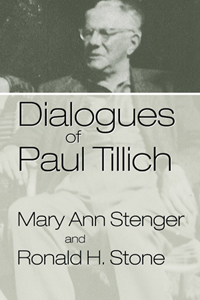 Dialogues of Paul Tillich presents Tillich's "conversations with past religious thinkers" basic to Tillich's thought, but also carries the dialogue beyond Tillich's own formulations into conversations with current issues regarding feminism, liberation theology, fundamentalism, world religions, and Christian realism. Tillich's life was one of "conversation seeking understanding." Tillich named his distinctive method of raising existential questions from culture to be answered by an essentialist reading of classical Christian theology the method of "correlation." This dialogue form invites others, past, present, and future, into the conversation, into relationships seeking understanding. Since his death in 1965, religious thinkers have continued to dialogue with Tillich's works in their own writings and conversations. The Tillich band of conversation around the world is both wide and deep. The essays in Dialogues of Paul Tillich reflect and contribute to that conversation. Although Tillich did not address twenty-first-century forms of such issues as religious pluralism, feminism, religious socialism, liberation theology, and fundamentalism, his theology offers methods of analysis and specific content that help us address these concerns today. Stenger and Stone place Tillich in dialogue with past and present thinkers and show how theology can benefit from a critical reading and adaptation of Tillich's ideas.